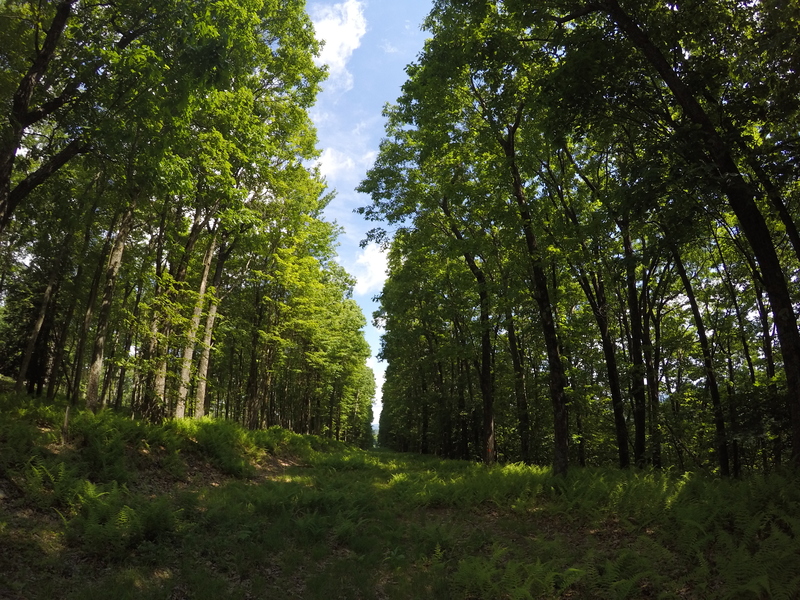 I started running trails in the spring of 2015, and it has kind of become an obsession for me. 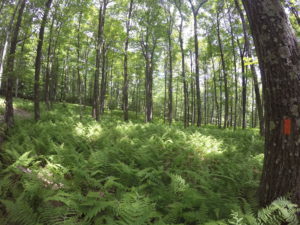 I have one trail running friend who loves checking out new spots, and we actually stumbled upon this stretch of the Bucktail Path by accident after we bypassed another trail head. 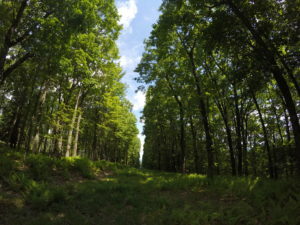 Bucktail Path is a 34 mile trail that starts in Sinnemahoning, Pennsylvania and traverses through the Johnson Run Natural Area and Elk State Forest. 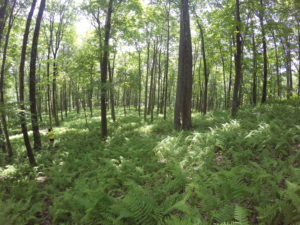 Our intentions were to run the Square Timber trail, near the village of Sterling Run in Cameron County, but we drove right past! After studying the map, we changed plans and were aiming to pick up Bucktail at the trail head at the intersection of Stillhouse Rd. and Ridge Rd. (see red arrow on the above image). 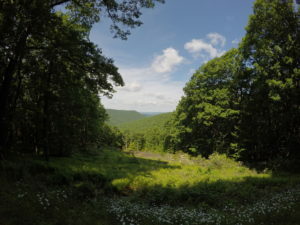 Parking is problematic, so we ended up driving a bit further and parking at the Square Timber Vista, which was another spectacular, serendipitous find! 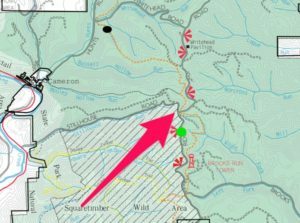 For a full map, please see the PA DCNR website here. This was a hands-down GORGEOUS trail! We ran about three trail miles out and back (see red dot on the map for our turn-around point), and could not stop saying how beautiful the scenery was. 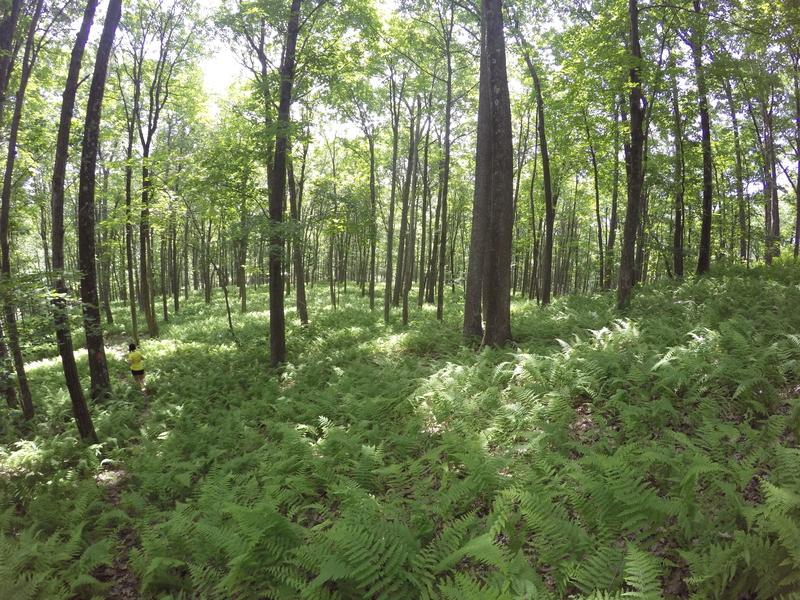 There is some weaving in and out of the woods across a gas line right-of-way, but even these clearings were stunning! 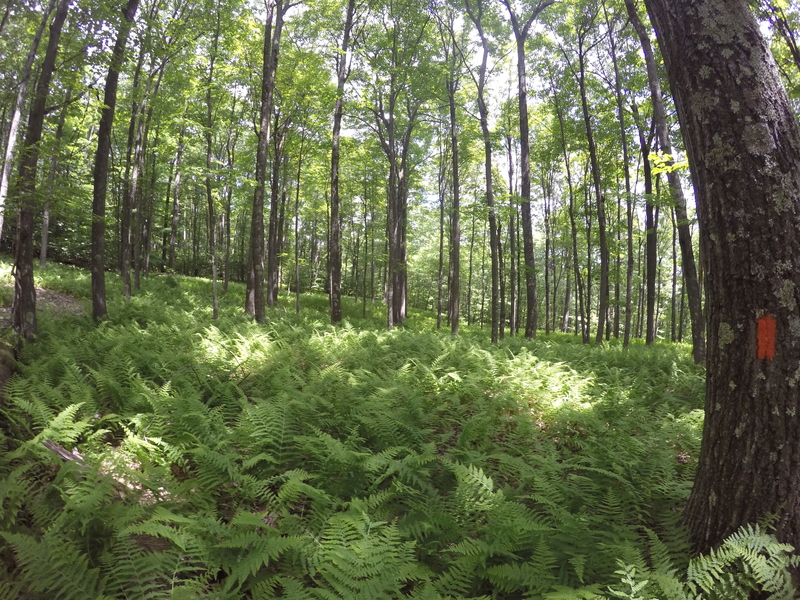 Back in the forest, there were ferns as far as we could see! The trail was very friendly, and very run-able. We did do quite a bit of climbing, but more between miles two and three (and on the back-side, of course). 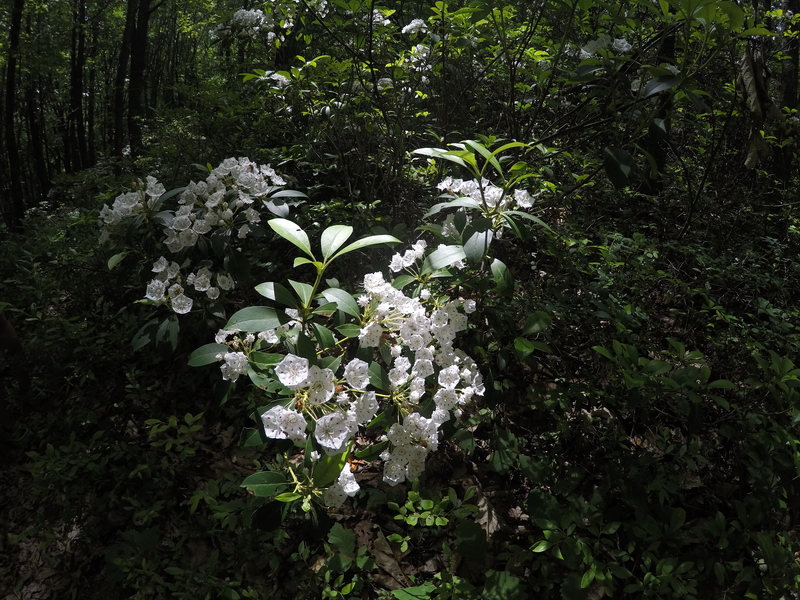 I would have to say that one of my favorite aspects to this run was the fact that the Mountain Laurel were blooming! 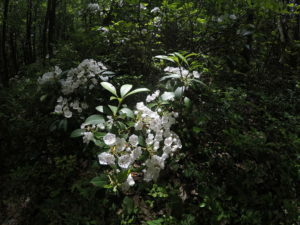 On May 5, 1933, the Mountain Laurel was declared the Pennsylvania state flower by Governor Gifford Pinchot, and for good reason! 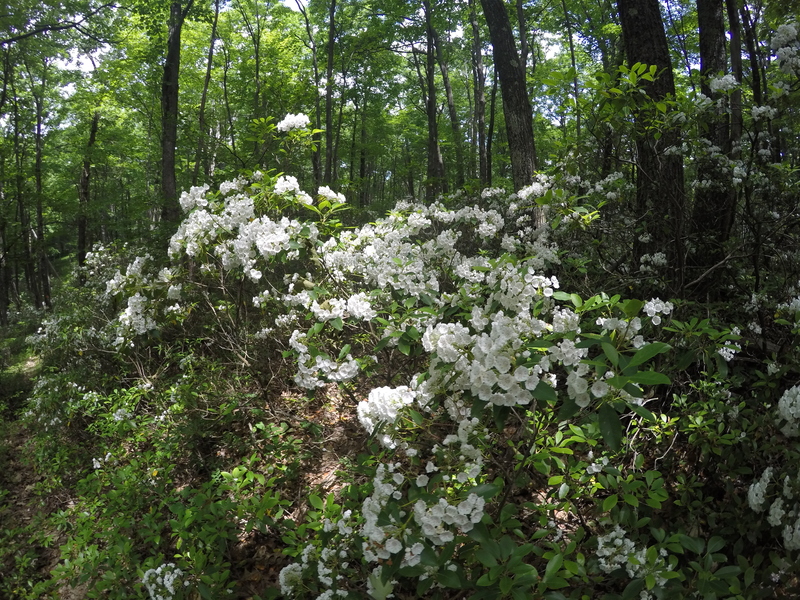 This showy shrub blooms across our beautiful state from June through July, predominantly in wooded areas. Just a short drive from Camp Eagle’s Nest, this section of the Bucktail path is a perfect day hike (or run!) for the intermediate level trail enthusiast! 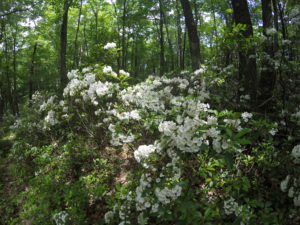 Make plans for a June hike, and you will not be disappointed by the spectacular floral display!